Stealth and Shooters have always been strange bedfellows ever since they first met. On one hand the genres don’t appear to mesh well, what with your standard FPS starring a one-man army who plows through hundreds of mooks with an ever-increasing assortment of deadly weapons, and stealth involving slow, laborious sneaking past individual guards and relying on not making sound or setting off alarms. On the other hand, that’s exactly why stealth games have a dedicated niche fanbase, exactly because it goes against the conventions of the genre and uses the core elements of an FPS in a creative new way. 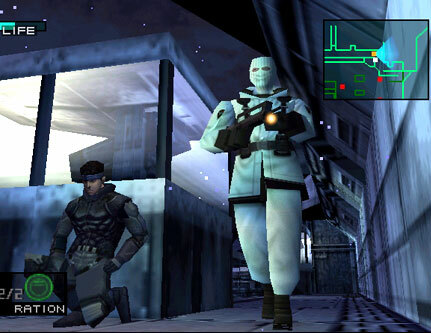 Here’s a screenshot from Metal Gear Solid. I would probably get lynched were I not to mention Metal Gear in this article, but I’ve never played nor know anything about the series so I don’t feel qualified to bring it up beyond this. Sorry. Picture from article by Nick Maizlin. Now, this article is mainly going to focus on stealth elements in otherwise non-stealth first-person shooters, because that’s where TF2 fits in. This problem presents a unique challenge to a developer; how does one balance the options of “murder everyone” and “sneak past everyone” in the exact same game? The first, and most obvious strategy, is to provide some sort of level-up aspect where the player chooses to put points into the things they want to get better at. Referred to as “RPG Elements,” these games get the stealth/action dichotomy for free because one of the focuses is aiding the player in choosing how they want to play the game. Bioshock, Deus Ex, and Star Wars: Dark Forces II are examples of this genre. A second option for games that don’t want leveling systems is to add “stealthy” inventory options as weapon and equipment choices. Perhaps a silenced pistol can kill enemies without alerting other enemies, or some sort of cloaking item grants the ability to bypass encounters. Loadout has a ‘disguise’ equipment that can let you get up close and pairs well with shotguns. 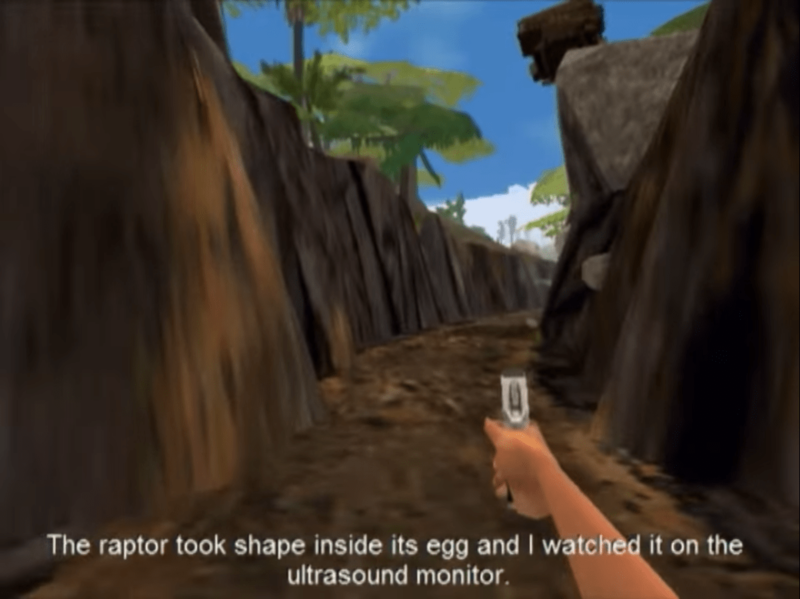 Jurassic Park: Trespasser had silenced guns which dealt reduced damage and nothing else, but had the game been coded correctly would have let you attack dinosaurs without their friends hearing you. Melee options fill this role in some games; in Sir You Are Being Hunted the hatchet is your only bet for killing a lone patrolman when others are nearby, with the obvious drawbacks being how close you must get to pull it off. A lot of games may treat a bow-and-arrow or crossbow as this sort of thing. The real fun starts when the game doesn’t have a leveling/point-buying system or swappable inventory options, and the only thing changing the experience is how the player chooses to use the weapons at their disposal. At this point the most common iteration is to give the player one or two equipment items that are designed to reward sleuthing or scoping out the situation before charging in. In Far Cry the binoculars obtained in the first level will add any identified enemies to your HUD, and color their icon based on how attentive they are to your presence. Harry Potter 7, the world’s pre-eminent magic-based shooter, gives you an invisibility cloak so useful that you can defeat the final boss by crouching in a corner until time runs out. In certain situations, the ability to summon allies or turrets can be considered a stealth element if you use them mainly as a distraction; this was my primary use of Snarks in Half-Life and Pheropods in Half-Life 2. Sometimes the environment provides the sneaky options. Eagle-eyed players can save precious bullets in Trespasser by looking for physics objects to drop on upcoming dinosaur heads. Screenshot from Research Indicates’ excellent Let’s Play of the whole game. Team Fortress 2 uses almost all of these tricks in the development of the spy class, obviously the one designed to appeal to the stealth aficionados. His disguise kit and invisibility watch are obvious examples, but notice also that he has several ways to obtain information that could extend his life. He can see enemy health on his HUD and use disguises to ascertain his opponent’s loadout. The sapper model visibly indicates when buildings are in range and the “Buy a Life” taunt lets him determine what direction the wind is blowing on the map. But think also of his character design; a dull-colored suit with very little distinguishing or contrasting colors. Contrast this to the average visibility of most class models (and the ultra-visible white labcoat on Medic; Valve wants enemies to see the medic!) As Nethero notes in this article, even Spy’s taunts are designed to remind players that visibility and attention-drawing are not encouraged strategies for their repertoire. But spy isn’t the only class designed for stealth; scout, pyro, and ninjaneers can all benefit from savvy map knowledge and and awareness of their surroundings. Every map in TF2 is designed to have flanking routes and hiding places. Pyro actually covers another ‘stealth’ option I don’t see in many games; the ability to afflict your enemy with a status condition that dissuades them from pursuing you. Perhaps that doesn’t quite count as stealth. This article is part of my “On Shooters” series, where I compare multiple games by focusing on a specific game mechanic or developer objective. To read the rest, click here! PASS Time – Pass, or Worth The Time? Why you really, really should not be a Battle Medic.